I smiled when I saw Mitali Perkins’s Facebook status update the other day. Apparently it was World Read Aloud Day—one of those things, like Mitali, that I can usually feel pretty good about (unlike Turn Off Your TV Week or Stop Eating So Much Takeout Month). 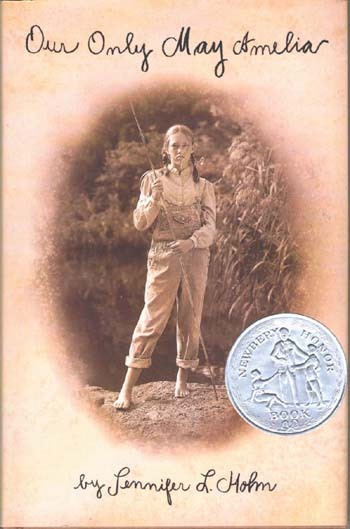 On World Read Aloud Day I read a chapter of Jennifer L. Holm’s Newbery Honor Book Our Only May Amelia to my ten-year-old daughter. Despite her love for Babymouse, she’d been resisting Holm’s May Amelia because of a preference for contemporary realistic fiction, and the sepia-toned photo of a girl in overalls on the cover just wasn’t cutting it. 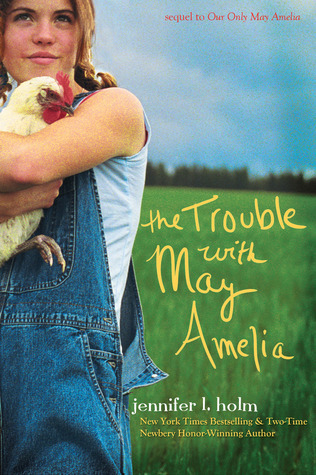 But she was intrigued when I brought home the sequel, The Trouble with May Amelia (see the May/June Horn Book for the review), with its upbeat color photo of a contemporary-looking girl in overalls (a cover that made me snort, but hey, whatever works, you marketing people). We read it, she loved it, and now we’re making our way through the first book. What I read to my five-year-old that evening was a little less literary. Visiting the office over school break, she had nabbed a paperback—Magic Hearts, an entry in Aladdin’s Candy Fairies series by Helen Perelman. The cover picture, a fairy decked out in pink glitter, had caught her eye, natch. 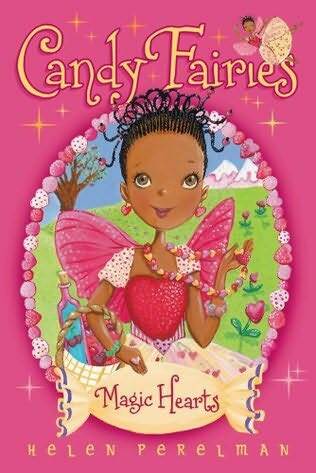 Candy Fairies is a dream come true for my kindergartner: fairies and candy, what else is there? Well, those people at Aladdin know what else. “Berry … the Fruit Fairy enjoyed making delicious fruit candies, but she also loved making jewelry. The more sparkle the better! Berry loved anything and everything to do with fashion.” For the five-year-old whose favorite dress-up outfit always includes sparkly rings and fairy wings (and who enjoys watching What Not to Wear, Project Runway, and America’s Next Top Model—jeez, we do need to turn off that TV), it’s book heaven. And while it’s not great literature, it did make me laugh out loud with this winner of a line: “Raina gasped. ‘Oh, Fruli!’ she exclaimed. ‘You scared the sugar out of me!’” Oh, Fruli, indeed. >Oh, I really shouldn't be jealous of a ten year old girl! I cannot wait to read The Trouble With May Amelia. >My twelve year old, who loved May Amelia, was pretty surprised at the cover of the new novel but is willing to try it "even though it is in color".